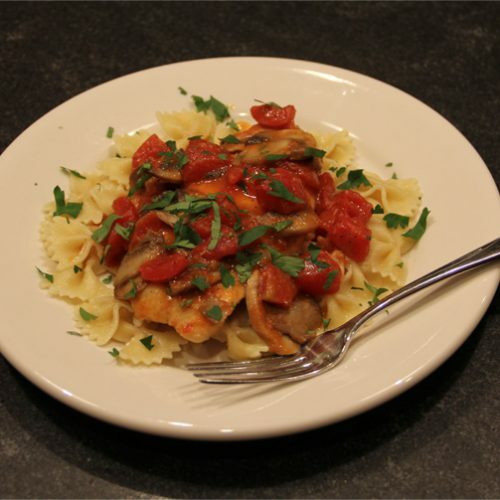 A very easy and excellent recipe combining tomatoes, mushrooms, and wine with chicken or veal. Serve with pasta or noodles and a green vegetable for a complete meal. Based on a recipe from The New York Times Cookbook, Craig Claiborne, 1961, Harper & Row, Publishers, Inc., New York, NY, p 159. Cut meat into thin even slices. Pound, if necessary, until until even. Evenly coat with flour. In a large skillet, over medium heat, heat olive oil. Add meat and brown on both sides, cooking until slightly underdone. Remove to a plate lined with paper towels. In remaining oil in skillet saute garlic and mushrooms until mushrooms release their liquid. Add tomatoes and liquid, wine, salt, and pepper. Simmer, reducing liquid somewhat, approximately 10 minutes. Return meat to pan, submerging in sauce, until heated through. Sprinkle with parsley and serve immediately.